The platform is positioned as a all-in-one sales tool for small and medium businesses. The audience includes everyone, who intends to sell products or services on the web. It doesn’t matter whether you are a newbie, a pro or just a curious person – 3dcart potentially comes up to everyone’s needs. The only nuance is that this is not the only quality specialized website builder available on the contemporary market. The major question is as follows: is 3dcart worth using or it makes sense to explore its renowned competitors like Shopify, Volusion and other niche representatives? All the top services are similar in their features. Each of them comes with its brand highlights, the terms of the paid pans differ and they have their own eco systems. What makes the service stand out from the crowd then? 3dcart is a structurally intuitive and standard eCommerce website builder. It is visually simple, but when it comes to practice, the things are far more complicated. The platform has soaked almost all the features that are specific for eCommerce systems. It is quite expensive to use such an advanced and feature-rich system to create a simple web store. There are too many unneeded things you’ll have to learn here. This is possible for newbies, but it will take some time to cope with the task. You’ll need around 1-2 weeks to explore all the system options and experiment with their application. Everything is logically structured here, but this is still not obvious. The dashboard comes with a simple interface design, which is not really attention-grabbing. It is as standard and functional as this is actually possible. Concise, saturated, logical and powerful – this is the impression 3dcart usability creates. This is not the simplest CMS you can find. There are multiple tutorials here, which will prove to be useful for many users. 3dcart has everything, which is needed to launch a web store of any size and complexity. This is a professional service, which does not lag behind other niche monsters in terms of functionality. In some aspects, it even excels them due to the rich variety of modules and settings provided out-of-the-box. The functionality of the service seems superfluous sometimes. The notable part of options, integrations and modules will remain inactive while using multiple projects created with the system. 3dcart abounds in features. Its potential will be enough even for the most demanding developers. There are multiple marketing and SEO tools, a powerful integrated CRM, a blog, gift certificates, automated emails, user groups, reports etc. The system offers the entire set of basic features. These include import/export of products with lots of detailed settings, payment acceptance (PayPal, Square, Stripe, Amazon Payments, credit cards) and delivery (FedEx, UPS, USPS, DHL) services. There are also warehouse stock product charts with sales statistics for a certain period. Integration with the most important social services is supported here. You can also make use of statistics collection from multiple directions, promo tools, order dashboard etc. Apart from the out-of-the-box basic feature set, a user has access to a variety of modules. Several dozens of them are installed by default, while others can be connected as needed. Of course, it’s important to understand what they are meant for before installing or using them. You need experience for that as the names of multiple integrations won’t tell anything to a newbie. Short descriptions of each of them partially simplify the situation. Each module has its individual settings depending upon its character. It goes without saying that application of many of them notably increases dashboard complexity. Modules can be compared to CMS plugins – a separate interface is responsible for the setup of each of them. 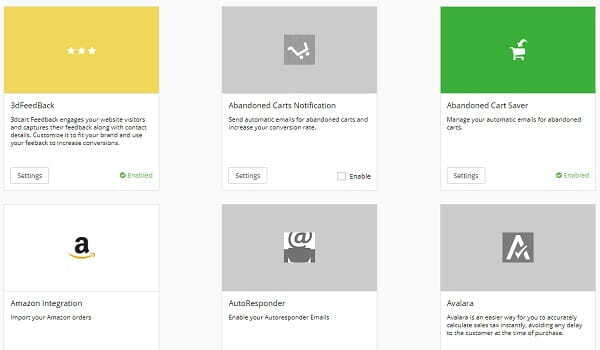 Here are a few samples: Facebook Ads/Connect, AWeber, LiveChat, MailChimp, POS, RSS Feeds, Saved Carts, Webhooks, Doba, eBay, Group Deals, Gift Wrapping, houzz, Multiple Ship To, Wish List, Aviary, AutoResponder, Zapier, Top Sellers. This is around a quarter of the entire module set. When adding a new product, you can choose its type (physical/digital product or gift certificate), category, add it to the warehouse stock list, add shipping information, SKU, MPN, GTIN, images/description, set up various price types and extra feature fields in any required amount (colour, size, material etc.). This is just a small part of all the available options – detalization of settings is really impressive here. The product list includes the search filter by categories, name, distributor, manufacturer and other parameters. Order list is very detailed – just like the rest of 3dcart features. Explicit statistics on all the scenarios with advanced search, client profiles, quick actions (invoice issue, status change or deletion etc. ), printing option and more. By the way, product images are stored in the library, where they are sorted out into folders – this makes it easy to find, replace, rename, view them etc. Drag&drop option is also supported during the download. Integrated blogging engine is a useful addition to the rest of features. It doesn’t lag behind niche platforms like WordPress in terms of post design customization and management. 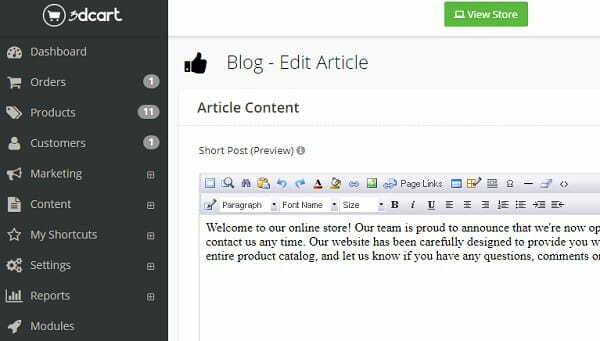 The engine makes it possible to create standard static pages, reviews of separate products and to format the menu of any complexity with subparagraphs. It is also possible to directly edit web page footers and headers, specifying their type (global or custom). The same principle is applied to the management of titles and content of all website pages. For user convenience, everything is stored in separate interfaces and is sorted out by hierarchy. This is a convenient approach. 3dcart comes with multiple integrated marketing tools. 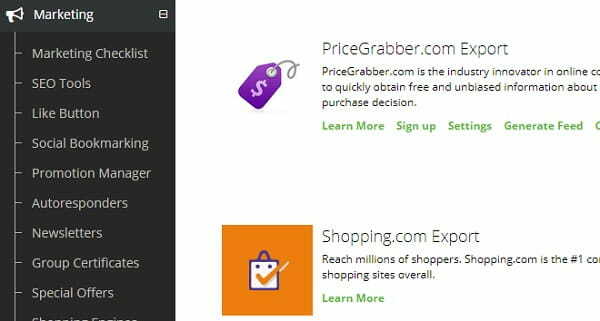 For example, there are integrated shopping engine plugins (Godatafeed, NextTag Feed Export, PriceGrabber.com and Shop.com Export, Shopzilla, Bing, Google Product Feeds, etc.) here. It’s also possible to manually edit the sets of social network buttons by means of code integration or add the ready made buttons from the Social Bookmarking section. Promotion Manager is basically the constructor of special offers by various algorithms of their formatting. Special Offers section contains useful services for Bing advertising, getting the phone number in the 1-800 format, free HubSpot CRM and Muzaara for automated marketing. Creation of email templates for standard and automated mailouts, groups of gift certificates, their import/export, marketing checklists – all these features are available here as well. 3dcart SEO Tools are presented to the advantage in the service. 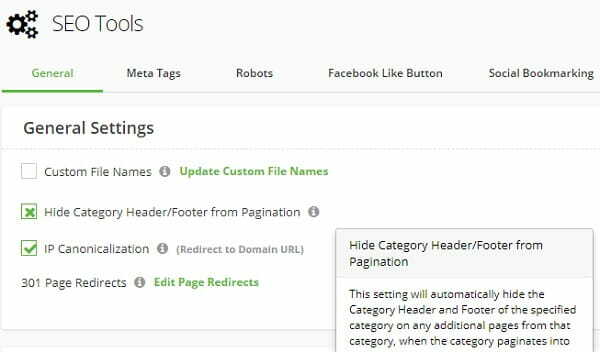 It’s possible to edit robots/sitemap files, enable canonical URLs, add 301 redirects, enter the values of standard and Open Graph meta tags. 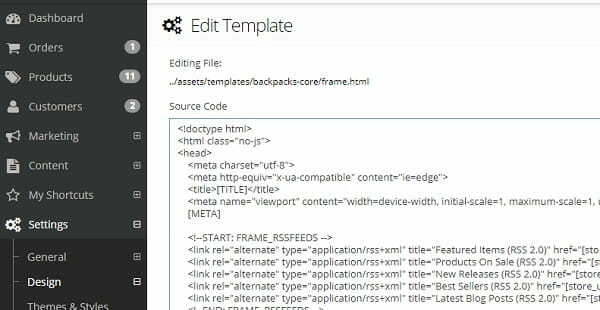 Google AMP technology for quicker web page loading on mobile devices, external analytic tools and Product Page Rich Snippets are also supported. It goes without saying that it’s also possible to add links to social network accounts, enable manual URL editing and other obvious things. Everything is included here. Analytics collection is also organized in the best way possible in 3dcart. There are numerous charts for profit calculation, user activity, stock items, sales, top products, shipping destinations, payment options etc. Whatever calculator you need, you can make the detailed inquiry for a certain period, print out the data, export the required file or immediately update the statistics. 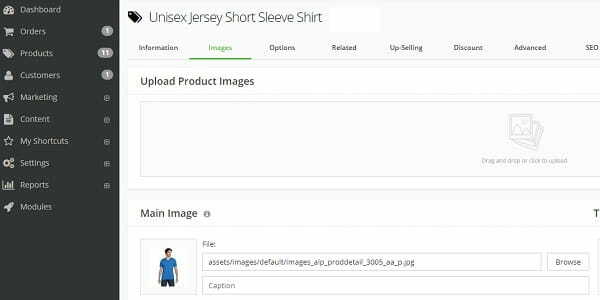 Obviously, you can set up shopping cart display options, product stock, pagination, sorting, set up the only format for image icons and the amount of specials on website pages. Ad banners, link display formats, login forms, website search, actions for standard triggers like «Add To Cart» button can also be set up here. Apart from that, you can create a form for client survey. An integrated CRM will further draw up the available data automatically. There is also an interesting Distributor feature, which will make it possible to make automated mailouts to suppliers and calculate shipping expenses from their locations. Your customers will also be able to separately explore information about brands presented in the web store. You can reach the «Manufacturers» section to add your brands with descriptions, logo, SEO settings. This is the standard content in the article format, singled out into a separate website section for your own benefit and for client convenience. Speaking about the security aspect, there are web store administrator access settings (two-stage authentication is supported) and IP – Security. This will let you block separate connections as well as the entire locations or address groups. Generally, 3dcart is a functionally advanced system. The flow of orders, modules and section is so tough that it creates the impression of perfection. It’s hard to realize that there may be something missing here. It is about the oversaturation of features here – everything is initially geared towards the needs and skills of experienced users. Newbies will have to choose the options they really need, ignoring the notable part of the systems’ feature set. 3dcart abounds in quality templates. Right after you access the system, you’ll get a default theme, but you’ll also be offered around 70 pre-installed templates. You will be able to switch between them in one click. There is, obviously, a preview mode here. You can delete extra templates or install new ones – the catalogue comes with over one hundred of themes available for free upload. All the templates are responsive and moderately versatile. 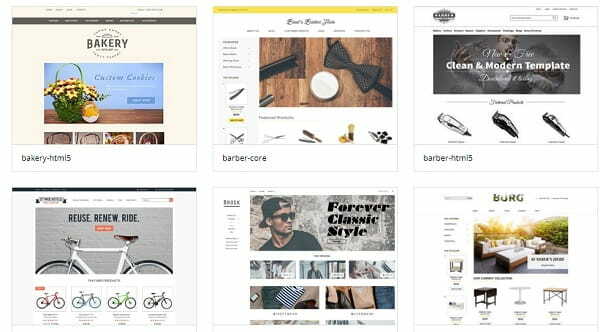 The majority of them are the variations of a classic web store structure, but there are also quite unusual niche solutions. All of them look impressive. Any user will be able to find a suitable template here, everything is provided on a great scale. Each template comes with demo content devoted to the separate eCommerce niche. Generally, you’ll not have to use strictly stock templates when working with 3dcart. Due to CSS and HTML editor options everything could be changed here (styles, images, colours, standard titles etc.). This is that very design customization level you expect to see in such an advanced system. You will be able to change the homepage structure, delete slider in the header or make something like that in the visual editor of the system. You can also manually edit your web store language in the design section by replacing the translations of standard template elements with those you need. In other words, localization from English to any other language is done manually. This is practical. There is also manual design option, email editing for email distribuitions and system messages, which are quite numerous here. The final impression about 3dcart design aspect is impressive. What we observe is notable simplification (at the first sight) on the background of general impressive functionality of the system. This is a benefit for newbies, who will hardly set up the design on their own. CSS and HTML customization options will be enough for professionals. The templates feature decent quality and you can also customize them as you need. 3dcart has a developed infrastructure and powerful tech support. Live Support Chat is available on all the dashboard screens. There is a quality knowledge base, a forum and even the eCommerce University. There is also a separate portal for web developers. This is all realized on a great scale. You can also call to the 24/7 support center of the service. They esure the unsurpassed customer support. $9/Month, Startup Store – 1 stuff user, 100 products, API and FTP-access, connect domain, 2 Email accounts. $19/Month, Basic Store – 2 stuff users, unlimited products, phone support, 5 Email accounts. $49/Month, Plus Store – 5 stuff users, CRM, customer groups, 10 Email accounts. $129/Month, Pro Store – 15 stuff users, automation rules, pre-orders, 30 Email accounts. It makes sense to mention the absence of transaction and setup fees. You can switch to a more expensive or a cheaper plan, while working on your website. By the way, there is an integrated program used to migrate web stores from other platforms to 3dcart, but you’ll have to pay for using it. VISA PCI Certification is also worth mentioning, which speaks about the reliability of hosting work. Apart from that, there is an offer for Enterprise level stores. For $400/month only, you will get secure level 1 PCI Hosting, unlimited stuff users and IP blocking security features. Thus, there are no many distinctions from bulk solutions here. You will just be aware of the fact that your web store will be able to withstand huge traffic flow. Correspondingly, you will be able to connect many managers to its servicing. It’s also important to consider the expenses related to the use of integration of external services. Almost all of them are initially free, but you’ll have to invest into an opportunity to extend your website functionality. Generally, 3dcart prices are quite standard for this niche and they can correlate to those of the competitors. Developed eco system and decent tech support. It will be difficult for newbies to explore and master the product from scratch without extra help. 3dcart complexity is a relative concept. It may seem scary to someone, but the rest of users will like the power of the system. 3dcart is definitely one of the best eCommerce solutions in the contemporary market in terms of functionality. When it comes to the convenience and user-friendliness of the interface and template customization options, the service lags behind Shopify – its most obvious competitor. As to the detalization of settings, it excels the system on one hand and is on the same level on the other hand depending upon the types of settings implied. Generally, we can recommend the platform to those users, who have the experience in the creation of eCommerce websites. The service is oversaturated with options. It seems like the developers keep adding all new niche features to it. There are many integrated features, which are activated in other systems through the use of external plugins. Does it make sense to use 3dcart? Yes, if you have serious intentions and understand the notions of marketing, SEO, coding etc. Otherwise, the service will seem unviable: it requires much attention and sets high quality standards. It doesn’t make sense to buy this, if you are not going to learn the essence of the system and use all its features to the advantage. There are simpler and easier-to-use platforms.